Water exercise is a great option for painful joints and arthritis pain relief. As a kid I loved to swim. In fact, you couldn’t keep me out of the water. The old swimming hole near my home was a summertime place of fun for me and my friends. Even in this day and age you still can’t keep most people out of the water. According to the Centers for Disease Control and Prevention, swimming is considered the fourth most common sports activity. It is also an excellent way to get in some aerobic exercise. Many older people can certainly benefit from water-based exercises, such as swimming, or other water activities that require equipment. Besides the benefit to the joints and inflammatory pain, exercising in the water has been found to benefit those who are overweight or suffering from injuries or lower back pain. Water exercise can also improve muscular and cardiovascular strength. Now that I’m getting older, jumping back in the swimming pool may not be such a bad idea, especially since I’m starting to develop joint and arthritis pain in my knees, hips, spine, and hands. Osteoarthritis is an extremely common condition. In the U.S. it affects over 50 million people and 80% of those are over 50-years-old. Although autoimmune disorder rheumatoid arthritis is less common, it still affects two percent to three percent of the population at any age. I’m starting to experience many of the common symptoms associated with arthritis, including morning stiffness, and painful and swollen joints. I also seem to have a restricted range of motion overall and I could benefit from losing a few pounds! Since activities like running and walking can also be painful on the joints, my physiotherapist recommended water exercises. 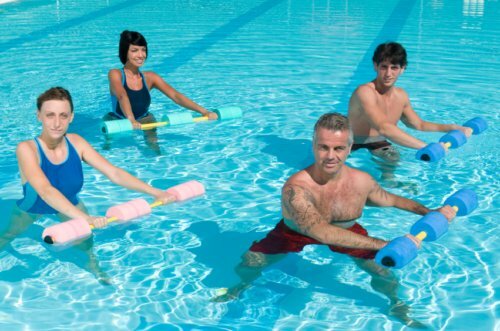 Water exercise eases arthritis pain and can actually help protect the joints. Some people with arthritis prefer swimming in cold water, whereas others find comfort in warmer water. Research is also very supportive of water exercise to treat arthritis relief. In a 1987 study published in the Scandinavian Journal of Rehabilitation Medicine, eight chronic rheumatoid arthritis patients performed water exercise therapy in a heated swimming pool. After two months of participating in the water exercise program, the patients’ maximal isometric and isokinetic quadriceps strength had increased by 38% and 16% respectively. A more recent review published in the journal Musculoskeletal Care in 2012 found that a warm water exercise called hydrotherapy reduced joint tenderness and pain in rheumatoid arthritis patients. It also increased grip strength and improved mood and overall wellbeing. In regards to osteoarthritis, a 12-week study published in the Journal of Advanced Nursing in 2007 found that aquatic exercise could significantly improve knee and hip flexibility, strength and aerobic fitness in osteoarthritis patients. For the study, data was collected from 38 patients at the beginning of the study, and at weeks six and 12 during 2003 and 2004. It is important to start slow if you have arthritis but currently don’t exercise. Use a flotation belt to stay upright when doing deep-water walking. Avoid water exercises if you are experiencing a severe rheumatoid arthritis flare-up. Some downtime may be needed until the pain eases up. If your joint pain, stiffness, or swelling continues to increase, consult your doctor. It is advised that people who experience heavy swelling related to knee osteoarthritis wait to attempt swimming or any other water exercise that would put the joints through a lot of movement. An aquatic center or community center with pools will have programs geared toward people with arthritis. Heated pools with temperatures that reach between 82 to 88 degrees Fahrenheit will help relieve arthritis pain. Pool walking exercise or jogging: The water exercise eases arthritis and joint pain as well. You can try it for yourself. A good place to start is in chest high water. Walk about 10 to 20 steps forward and then about the same amount of steps backward. Eventually you will increase you speed and your difficulty level. Jogging will also increase your intensity. It is good practice to alternate between water walking and jogging for 30-second intervals for at least a five-minute period. Water aerobics: Water aerobics (also known as waterobics, aquafit, or aquatic fitness) includes water yoga, aqua aerobics, or aqua Zumba. Water aerobics tend to be strenuous by nature. Examples of water aerobic exercises include strengthening or resistance exercises and range of motion workouts that prevent joint stress. Hydrotherapy: Hydrotherapy is part of physiotherapy, occupational therapy, and naturopathic medicine. It is used to treat rheumatoid arthritis and osteoarthritis. This therapy is different from swimming since it involves water exercises in a warm water pool. The temperatures are usually warmer than a normal swimming pool at 33 to 36 degrees Celsius. The exercises tend to focus on slow and controlled movements and relaxation. Side and forward lunges: Side and forward lunges are among the most effective pool exercises for joint pain. It is a great way to strengthen the muscles and improve the range of motion of joints. To perform the exercise, stand near the pool wall for support and take a large lunge forward; however, avoid letting the knee go past your toes. Return your leg to the starting position and then repeat on the other side. Side lunges are a little different. Face the pool wall and take a large step to your side with your toes facing forward. Repeat on the other side. Try doing three sets of 10 lunges and side steps. Consult with a doctor before participating in water-based exercises to make sure they are safe for you, especially if you have certain medical conditions such as diabetes, multiple sclerosis, thyroid disease, heart or lung disease, circulatory problems, low or high blood pressure, skin problems, or any other serious health condition. Everyone reacts differently to heat. People who feel nauseous or lightheaded should get out of the pool immediately. Avoid using pools or spas after drug or alcohol use. They may increase or reduce blood pressure, or cause drowsiness or sleepiness. Danneskiold-Samsoe, B., et al., “The effect of water exercise therapy given to patients with rheumatoid arthritis,” Scandinavian Journal of Rehabilitation Medicine, 1987; 19(1): 31-35, http://www.ncbi.nlm.nih.gov/pubmed/3576139. Al-Qubaeissy, K.Y., et al., “The Effectiveness of Hydrotherapy in the Management of Rheumatoid Arthritis: A Systematic Review,” Musculoskeletal Care, 2013; 11(1): 3-18, doi: 10.1002/msc.1028, http://www.ncbi.nlm.nih.gov/pubmed/22806987. Wang, T.J., et al., “Effect of aquatic exercise on flexibility, strength and aerobic fitness in adults with osteoarthritis of the hip or knee,” Journal of Advanced Nursing, 2007; 57(2): 141-152, http://www.ncbi.nlm.nih.gov/pubmed/17214750. Noe Pagan, C., et al., “Water Walking 101,” Arthritis Foundation web site, http://www.arthritis.org/living-with-arthritis/exercise/workouts/simple-routines/water-walking.php, last accessed November 19, 2015. “Exercises,” UW Medicine Orthopaedics and Sports Medicine web site, http://www.orthop.washington.edu/?q=patient-care/articles/arthritis/water-exercises.html, last accessed November 19, 2015. Balch, J., et al., Prescription for Natural Cures: A Self-Care Guide for Treating Health Problems with Natural Remedies Including Diet, Nutrition, Supplements, and Other Holistic Methods (Hoboken: John Wiley & Sons, Inc., 2004), 50-51. Acosta S. J., “Water Exercise Eases Arthritis Pain,” EveryDay Health web site, http://www.everydayhealth.com/osteoarthritis/water-exercise-eases-arthritis-pain.aspx, last accessed November 19, 2015. “Health Benefits of Water-based Exercise,” Centers for Disease Control and Prevention web site, last updated March 6, 2013; http://www.cdc.gov/healthywater/swimming/health_benefits_water_exercise.html, last accessed November 19, 2015. “What is hydrotherapy?” Arthritis Research UK web site, http://www.arthritisresearchuk.org/arthritis-information/therapies/hydrotherapy/what-is-hydrotherapy.aspx, last accessed November 19, 2015.